FILE - An asylum-seeking boy from Central America runs down a hallway after arriving from an immigration detention center to a shelter in San Diego, Dec. 11, 2018. Eight immigrant families separated under Trump administration policy filed claims Monday seeking millions of dollars in damages for what a lawyer called "inexplicable cruelty" that did lasting damage to parents and children. The claims allege that many children remain traumatized, including a 7-year-old girl who won't sleep without her mother and a 6-year-old boy who is reluctant to eat. 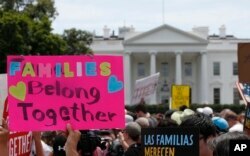 FILE - Activists march past the White House to protest the Trump administration's approach to illegal border crossings and separation of children from immigrant parents in Washington, June 20, 2018.